Part of our summer was spent visiting World War 1 battle sites in Belgium and the war cemeteries around Ypres and Passchendaele. When we heard the National Trust had some special plans in Manchester to commemorate the centenary of WW1 and were looking for volunteers we were all super keen to get involved. 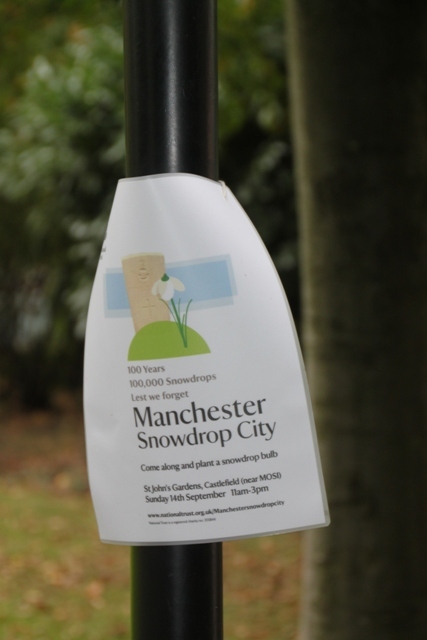 Their ambitious plan was to plant 100,000 snowdrops all around the city throughout the month of September. Snowdrops are the flower of choice for two reasons – apparently they are a sign of peace but also a link to the white war graves. An early source of nectar for bees as well, the bee is the symbol of Manchester so the snowdrop ticks all the boxes. Gardeners we are not – knowing next to nothing about planting anything never mind snowdrops, but as we arrived the very helpful National Trust people got us all set up and showed us how best to plant the bulbs. We got to work straight away. The sun shone a bit, we dug holes (very hard) and planted snowdrops (very rewarding), Son had the best time ever and was reluctant to leave. Between us we planted about 150 bulbs – not so great in the overall scheme of things – but good to get involved and be part of this experience. We will return next year when hopefully a beautiful display of snowdrops will herald the end of winter and serve as a tribute to those who gave their lives in the Great War. We really enjoyed taking part Rosemary and I think for our son it was important to do something like this. 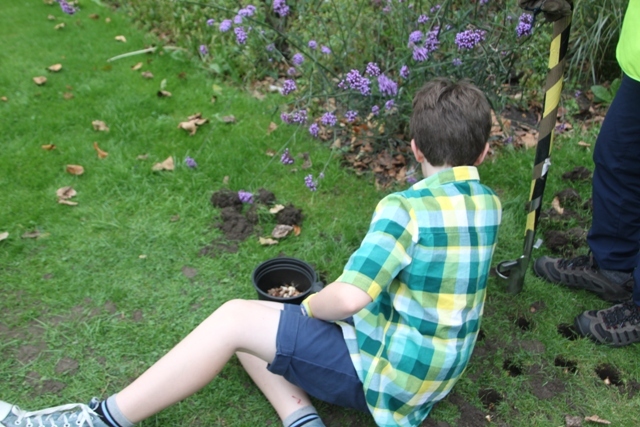 We took him to Belgium this summer to see the war sites but this was something he could get directly involved in. Great project and I’l love to see a photo of the results in bloom next spring. We’ll definitely be back to check them out!! Watch this space. 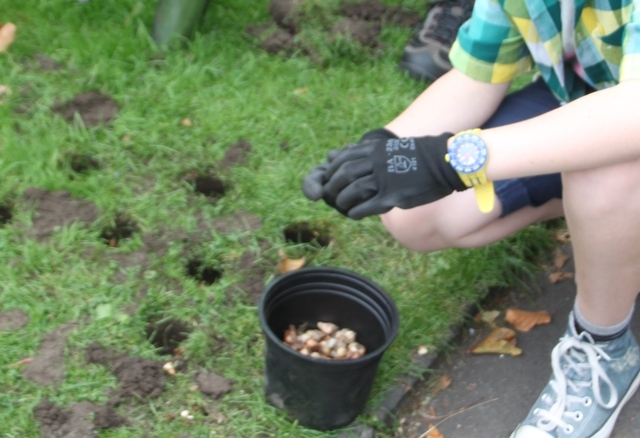 I just loved the sound of it – it gets kids planting but also actually doing something to remember the war. We had such a simple yet fun afternoon and all got a lot out of it. Snowdrops are growing wild around our house like a carpet. Beautiful! It is the frist flower that starts spreading spring feelings! I love to see the first snowdrops – this time we will be even more excited having been involved in planting! Seeing your own labour grow, always is most exciting! I remember when I planted my first tulips in fall after we moved into our house. It was hard to wait about 6 months until they had their first bloom! Beautiful idea and a great way to get all of you involved! It was great – we were all equal in this task, no-one any better (or worse) than the other. As well as being fun it felt worthwhile too. It was great to get involved – my son really enjoyed and I hope, like you say, he will remember it! This is a beautiful idea for a tribute–so fitting! I think it’s really neat that you, and your son, got involved. Looking forward to photos of the flowers when they bloom! We’re looking forward to seeing them bloom very much – it was such a great thing to be a part of. What a beautiful idea and a great project for the family. Can’t wait to see the finished product! I love snowdrops anyway but these will be extra special!! It was such a great thing to be a part of. What a great project! It’s also a wonderful family activity! I look forward to seeing the pictures of when the flowers are in bloom! We had a great time (back breaking digging and all!! ), it was lovely to get involved and do something to help bring this project to life. Hopefully some of our snowdrops will make it – despite our lack of green fingers!! I read about this in a National Trust magazine (we are members and get a magazine which I routinely never read except for this one time). We just showed up on the day and joined in. They were looking for loads of volunteers – 100,000 snowdrops is an awful lot – but we didn’t see vast numbers in the couple of hours we were there. The “official” National Trust people who were overseeing things were all volunteers too, part of a group who meet every Sunday to get involved in outdoor projects at the various places. Apparently some go every week, some go once a year, just depends. Seemed like you could get involved though without booking ahead/too much difficulty. This is the first time we got involved in something like though so not sure how other projects would be. There is a link on the website – nationaltrust.org.uk about volunteering which might be useful?? I’m waiting on go-aheads from work. 🙂 In the meantime, I’m just pinning interesting things. Thanks for the extra info! You’re welcome, anytime!! Happy planning. this is beautiful tribute – you have such unique way to introduce a story to be interesting! 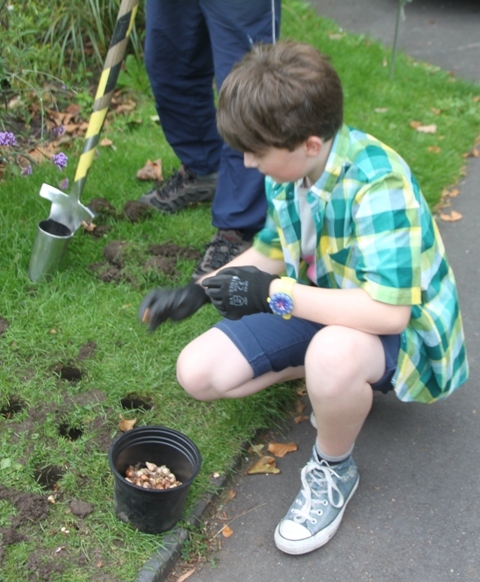 We loved being involved – looking forward to seeing the snowdrops after the winter passes! well done – keep up with your hard work – My compliments! wonderful post & excellent idea: I love snowdrops – the symbol of springtime… 🙂 my very best and cheers from Toulouse, France! Thank you Melanie, I love snowdrops too!! Thanks for visiting.